"Known for her perceptive depictions of women and children, Mary Cassatt was one of the few American artists active in the nineteenth-century French avant-garde. Born to a prominent Pittsburgh family, she traveled extensively through Europe with her parents and siblings while a child. Between 1860 and 1864 she attended the Pennsylvania Academy of the Fine Arts in Philadelphia. At the age of twenty-two Cassatt went abroad, studying old master paintings in European museums. In Paris, she studied with prominent academic painters and independently at the Louvre. Returning to the United States for a short period, Cassatt went back to Europe in 1871, spending her time painting and copying the old masters in museums in Italy, Spain, and Belgium. In 1874 she settled permanently in Paris. Although she had several works accepted for exhibition by the tradition-bound French Salon, her artistic aims aligned her with the avant-garde painters of the time. In 1877, Edgar Degas invited her to join the progressive group of artists popularly known as the impressionists; she particularly admired the work of Degas, as well as that of Manet and Courbet. 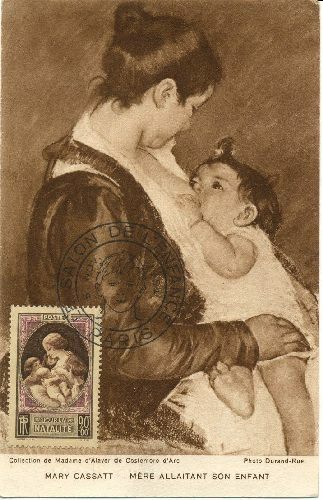 A close working relationship developed between Cassatt and Degas. From similar upper-class backgrounds, the two painters enjoyed a friendship based on common artistic sensibilities and interests in bold compositional structure, the asymmetry and high vantage point of Japanese prints, and contemporary subject matter. During her long residence in France, Cassatt sent paintings back to exhibitions in the United States. Thus, hers were among the first impressionist works seen in this country. In advising wealthy American patrons on what to acquire, she also played a crucial role in the formation of some of the most important collections of impressionist art in this country."